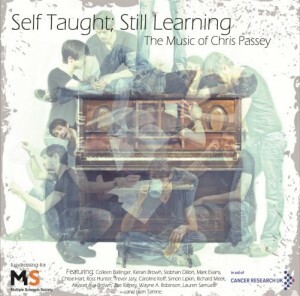 Self Taught; Still Learning – The Music of Chris Passey is a collection of songs by new West Midlands composer Passey that enters the ever-growing list of albums showcasing new musical theatre writing sung by a range of West End stars. Many of these songs are taken from a concept musical called Bridges but others were written especially for the album and for the singers who agreed to perform. And in a nice touch, the profits from this CD are being split between the two charities MS Society and Cancer Research. Which makes it a little sad to say that this is not an album that I particularly loved, something about it just didn’t click with me and despite a few listens, it isn’t a collection that feels destined to get repeat plays in this household. Things get off to a shaky start anyway with an intro by “YouTube’s Miranda Sings” – of whose schtick I’m not a fan and feeling a little at odds as a way to introduce this album and her performance of a song at the end feels rather misjudged even if it is just a bonus track- it is one joke stretched thinly and I can’t imagine why anyone would ever want to listen to more than 15 seconds of it. In terms of the song-writing, it is quite difficult to fully articulate what it is that doesn’t click with me, the best I can do is to describe it as a loose-limbedness. For example, ‘Take Me With You’, a duet between Simon Lipkin and Siobhan Dillon, is musically interesting but I’d’ve liked a stronger melody line – the tune feels a little unfocused especially towards the end where a touch more simplicity would tighten up the song and heighten the emotion for me. This applies to many of the songs, where this slipperiness, whether in shifting time signatures or free-rolling vocal performances, feels like too much of a distraction and detracts from the lyrical ingenuity at work. That’s not to say I didn’t like any of it: Passey’s own performance of ‘How Would They Feel?’ is superb, probably the best song on here, and much closer to what I like in my musical theatre; Mark Evans and Ross Hunter’s duetting in the quirky jazz-inflected ‘Sin That I Am In’ is lots of fun and Kieran Brown’s ‘If They Only Knew’ has a pleasing simplicity about it that really works as does the opening of Allyson Ava-Brown’s impassioned ‘Three Tiny Words’. So there’s definitely potential here, and I’ll be interested to see if a production of Bridges makes it to London so that these songs can be sampled in their true context to see how effective they are. As it stands, I’m not too sure that they are my cup of tea but that probably says more about me than anything. If you can only download one song, make it…Chris Passey’s How Would They Feel?